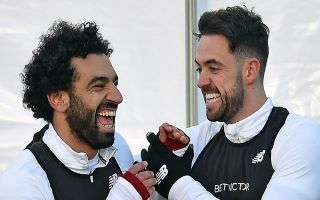 Liverpool loanee Danny Ings has revealed that he’s had a bet with Mohamed Salah over who will score more goals this season. The 26-year-old secured a season-long loan move to Southampton this year as he looks to put an injury-plagued stint at Anfield behind him and rediscover his best form. Things haven’t started too badly for him as he’s bagged three goals in five Premier League games so far this campaign, and it’s good news as far as his bet with Salah goes. As noted in his comments below, the pair have had a bet on who will score the most goals this season. Given Salah scored 44 in 52 games in all competitions last year, with 32 of those coming in the league, it’s fair to say that the Egyptian international starts out as a heavy favourite to win it. That’s probably why the prizes on offer are hilariously one-sided, as if Ings wins, he gets a holiday to Egypt. If Salah wins, the poor guy just gets a coffee. “Mo helped me a lot when I was at Liverpool and we exchanged a few messages,” he said, as per The Sun. “He said, ‘Let’s see who scores the most’ and I laughed it off, given how good he is. “Mo is one of the best players in the world. He is so worshipped in Egypt so I said if I win the bet he has to give me access to half of Egypt on holiday but if he wins, I need to buy him a Costa coffee!”. Salah has had a slow start to the season compared to the standards set last year, as he’s managed just two goals in his five outings.